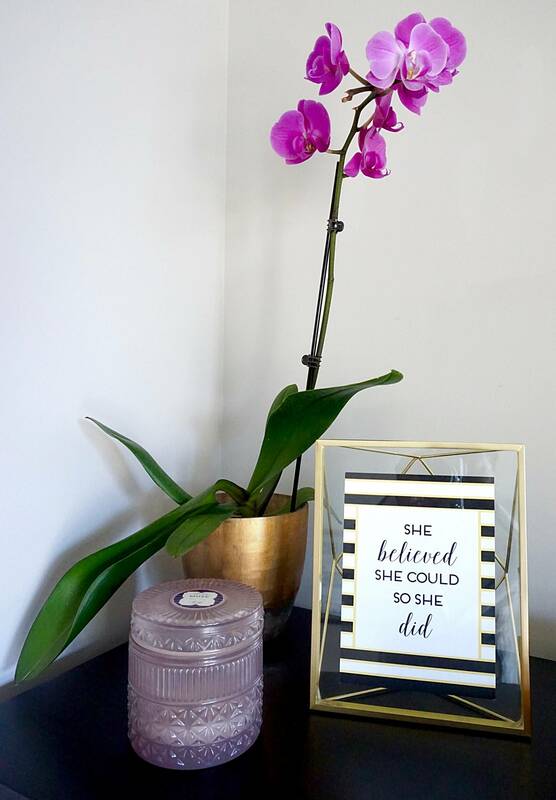 Have you heard of a she shed? It’s a thing. It seems that women everywhere are carving out a space just for them, a room of their own. A she shed is like a man cave, but with nicer decor and it smells much better. If you are fortunate enough to create a space away from your home (but close enough so that your family doesn’t think that you ran away – although that is exactly what you are doing) that is the best of all worlds. A lock on the door is a good idea to keep out the uninvited and keep it free from pests (I’ll let you decide what/who fits that description). This article has all kinds of lovely she shed ideas for the backyard. I don’t have an outside space for my she shed, but I have created a space within my home, a space just for me. We moved into a new house when my son was in his freshman year of college, but of course we kept a bedroom for his visits home. 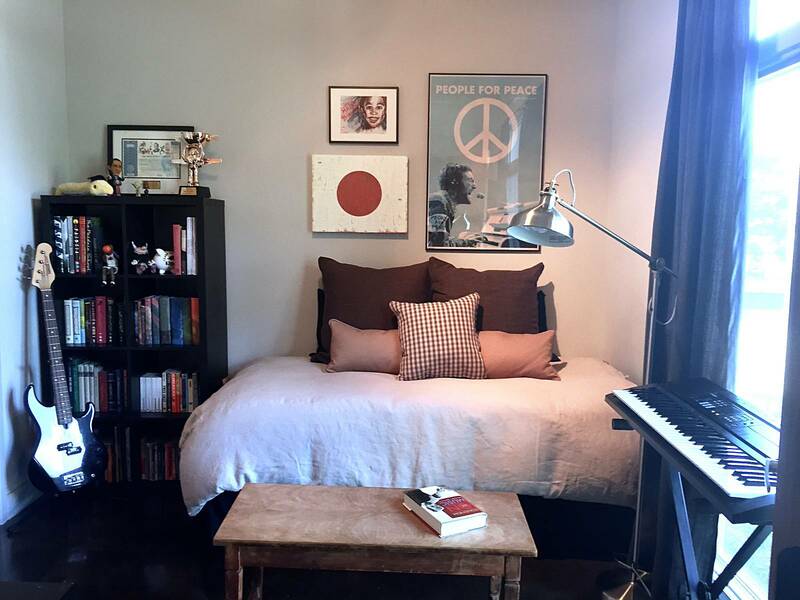 It is a small room, but I decorated it to reflect his journey from a teenager to a young man in “vintage-industrial” to match the concrete floors. He’s a musician so I made sure that his instruments were on display. But in the move I lost our office space and now I was writing at the dining table. Privacy and noise were not a problem because during the day I am the only one at home, but it was a problem creatively. The kitchen, dining and living room is one big space so I was always in the same room – cooking, eating, watching tv, spending time with my family or writing – it was all in the same room. I had no division between my mom brain and my creative brain. My son’s room was empty 9 months of the year and I tried to use that room to write; I put a coffee table and desk in there to make it more “lounge-like”, but I was not inspired. It was my son’s room and it looked and felt like it. 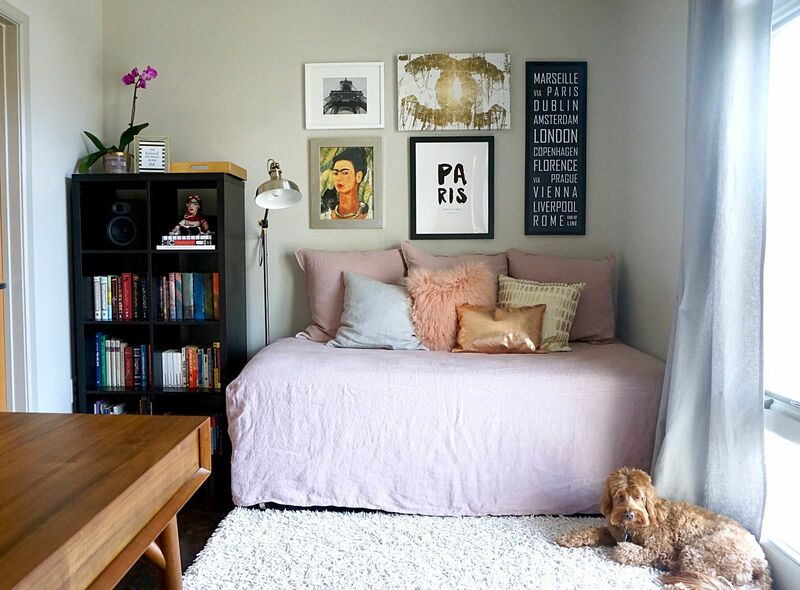 When my son moved out of the dorms and into an apartment, I realized that his times at home were going to be shorter and further apart – and that his room was wasted space. I decided to redecorate and make an office. Unlike the office in our last home that was used by the whole family, this office would be ALL MINE and I would decorate it as such. In fact it wasn’t going to be an office, it was going to be a place of inspiration, relaxation and creation. A room of my own. I had to design around the small space, gray walls, bookcases and bed that were already there, but otherwise I could do whatever I wanted. I’ve never decorated a room that was all mine and I was excited! I really designed this room; I made a design board with fabric swatches and cut out tiny photos of chairs, desks, rugs, curtains and art work until I found the right combinations. 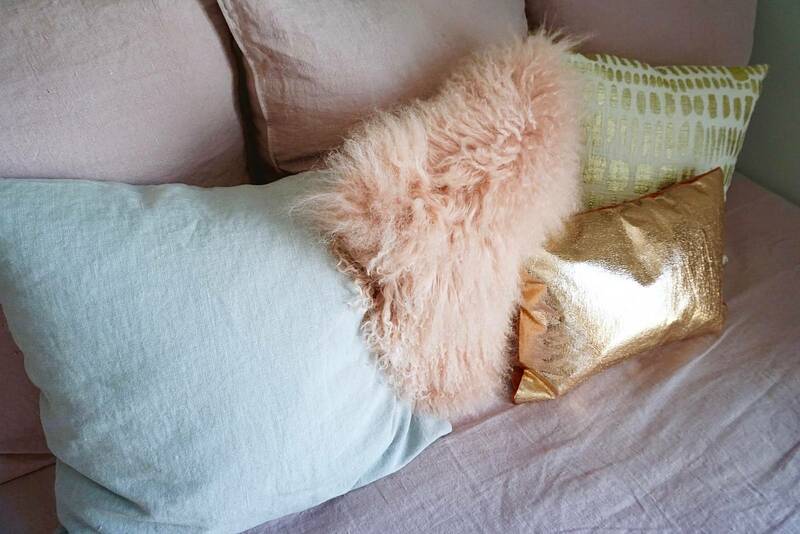 I chose pink, my favorite color, as the primary color with white and gray as complements; the palette was soothing but with glamorous accents of gold. I switched the dark gray curtains for a lighter gray, bought a much nicer desk and chair and turned the bed into a sofa with the help of a custom-made daybed cover and throw pillows. I left my son’s books and albums on the shelves, but otherwise packed up his things and put them in the closet. I added some of my favorite books about Paris, flowers and a really good smelling candle. A new white rug brightened up the industrial concrete floor. 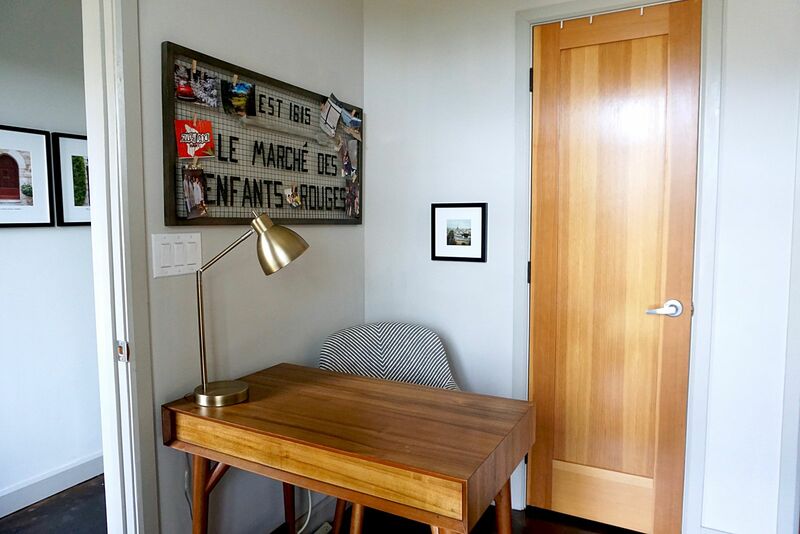 I looked forever until I found the perfect bulletin board – really a French-inspired metal wall hanging. 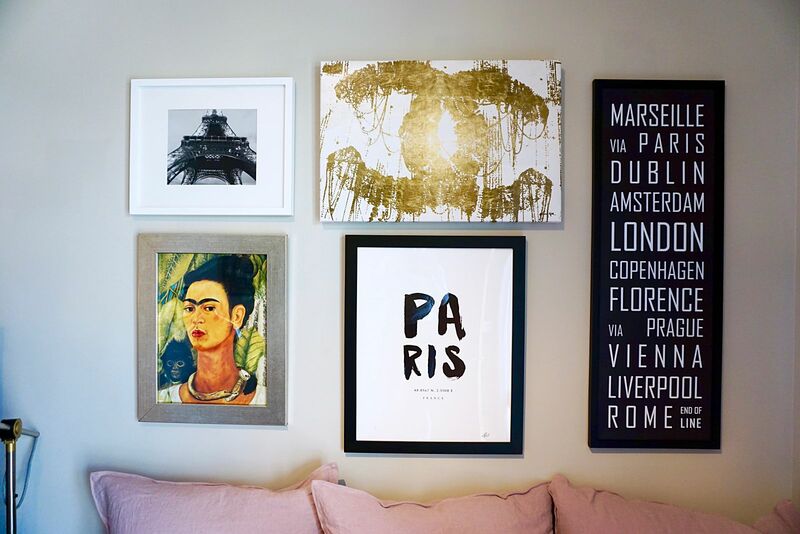 The art wall over the daybed is an eclectic mix of mass produced and high end original art, but all pieces that I picked just because they make me happy. 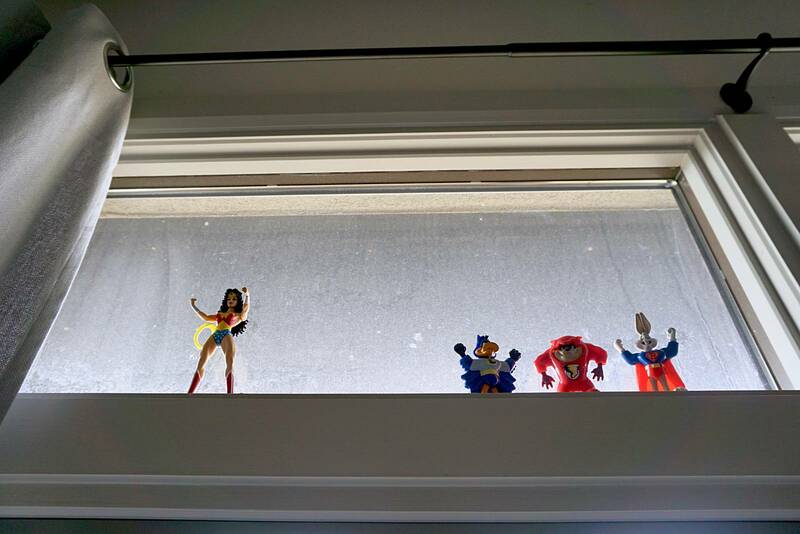 I made sure everything in the room was something that I love and makes me happy – right down to my collection of toy figures in the window. When my son returns home for holidays I swap the flowers and candles for his trophies and keepsakes and the daybed cover for a tan duvet, but honestly I don’t think he cares or notices the effort. He didn’t even come home for the summer this year, so I haven’t had to switch over the room; it’s been my space continuously for over a year now. Sometimes my daughter does her homework in there if she needs a quiet space. My husband is allowed to use the room when I’m not; he often has conference calls in the evening. Both of them love the feel of my room, they love the vibe, however they are careful to leave it the way they entered. 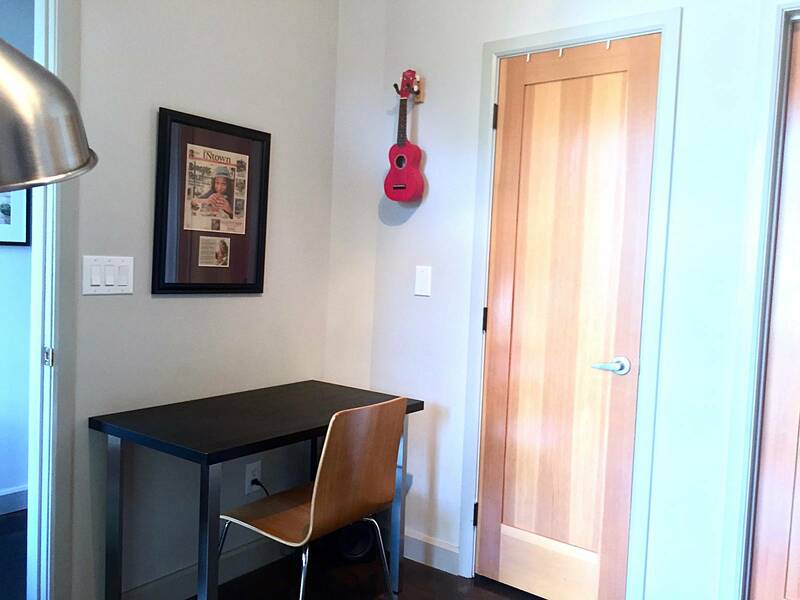 I only use this room when I write, create, plan, brainstorm or just need to think; I do not use it to pay bills or respond to teacher emails or write grocery lists – no household work is done in there. I have a ritual when I enter: I open the curtains, light the candle and hook up my iPad for music. I listen to rap or pop (from my Spotify playlist) if I am doing tasks that don’t require concentration like updating my social media, otherwise it’s jazz, coffeehouse indie or the “chill” channel if I am writing. When I sit in this room I immediately go into a zone and my mind is clear. It’s remarkable. A room of my own. Do you have such a space? Perhaps it’s time to create one! P.S. You may also like more blog posts about design and decor. I discovered your site through your comment on XO Sarah (hope that’s not too creepy. LOL). I do not have my own She Shed, but I love the concept. 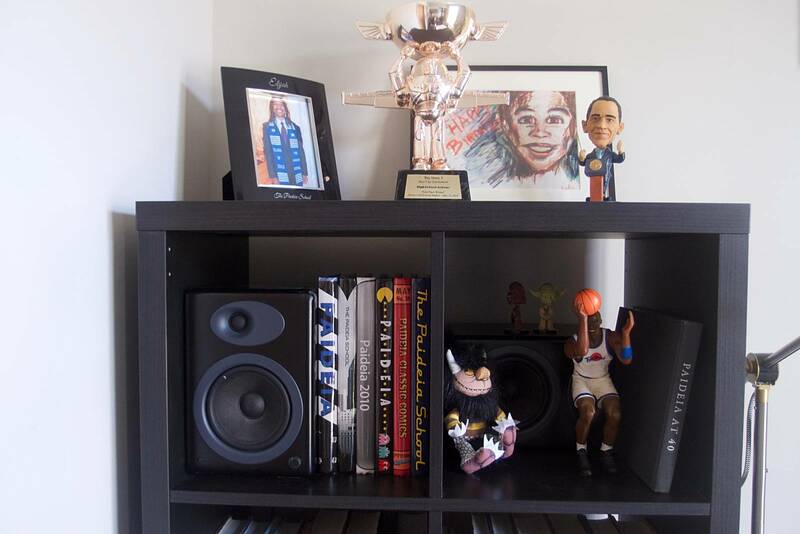 In our previous home–a rented condo–I had my own office. I’m looking to create something like that again once we get into a condo of our own. LOve it! I created a writing space for myself in our home a year or so ago. It’s been great. The only problem: everyone in my home loves MY space. So it’s kinda become a free for all. I’m constantly telling my kids to get out. LOL I may need to rethink my design idea and put some steel bolts on the door!